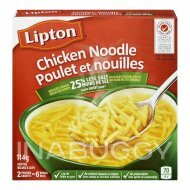 A classic comfort food, Cup-A-Soup Chicken Noodle Instant Soup Mix (58g)makes a flavourful chicken broth filled with vegetable flavours and scrumptious noodles. Children and adults alike will enjoy this perennial favourite that cooks in just minutes. 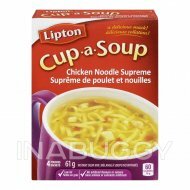 When you’re craving something warm and satisfying, grab Lipton Cup-A-Soup Chicken Noodle Instant Soup Mix and enjoy the soul-restoring combination of flavourful broth and scrumptious noodles. 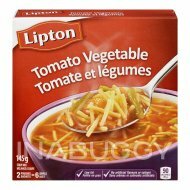 Lipton Cup-A-Soup Chicken Noodle Instant Soup is perfect as a quick meal, side dish or snack! 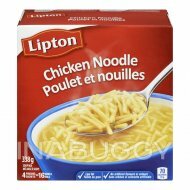 Delicious and convenient, Lipton® Chicken Noodle soup is low fat, less than 100 calories with no artificial colours or artificial flavours. Not only do they fit into your busy schedule, they’re a smart choice for anyone that’s watching their intake. Meal Idea: Serve as an accompaniment to one of your favourite sandwiches! For inspiration on different options, like Knorr’s Parma-Rosa Grilled Vegetable Sandwich, check out Knorr.ca! We love food the way you love food. To make great tasting meals you really have to love everything about food. We know how you value good, nutritious, flavourful food, and authentic home cooking. In order to help you deliver mouth-watering meals, we go to extraordinary lengths in pursuit of great flavour. This means we always go the extra mile, not accepting mediocrity, never giving up. We bring flavours from around the world to our kitchens and our 286 chefs skillfully develop exciting recipes that you can recreate in the comfort of your own kitchen.